Jupiter in radio waves looks like a giant lizard due to the powerful magnetic field surrounding it. 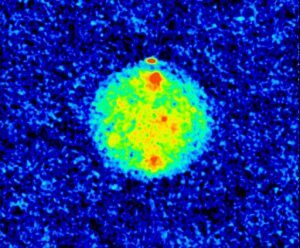 Charged particles erupted from its moons are captured by this field and give off radio waves. We aim radio telescopes at the Sun, planets, moons, and planetesimals in our Solar System. Used as telescopes, they tell us about the temperature, composition, and magnetic activities of these bodies. Used as radar devices, they map surfaces, obtain distances, and clock spins and speeds. Used as receiving stations, they help NASA and other space agencies keep track of spacecraft sent into the outer reaches of our Solar System. The surface of the Sun is a strong source of radio emission – and of potential harm, so our 45-foot telescope in Green Bank, West Virginia monitors the Sun the entire time it is in our sky. The Sun, like most stars, has a gigantic magnetic field. As the Sun spins, its surface wraps the field into swirls, tangling it. To regain order, field lines reconnect at the congestion points, snapping off unwanted threads and loops to make shorter, direct paths from pole to pole. Any material still clinging to the cast-offs is carried away as a wave of charged solar material. We call these solar flares. When the discarded loops are large enough to explode off into the Solar System, they are called coronal mass ejections (CMEs). These tsunamis of charged particles can interrupt radio communications on the Earth, fry sensitive equipment in satellites, and even endanger the astronauts on the International Space Station. Forecasting this “space weather” is a top priority science goal as reported by the United States’ astronomical advisory committee. Radio telescopes can see the burps that often precede CMEs, and are great warning devices. The 45-foot is a test facility for a large scale array of telescopes called the Frequency Agile Solar Radiotelescope, or FASR. Radio telescopes discovered the surprising reflections of ice at the poles of the otherwise hot, innermost planet in our Solar System, Mercury. Mercury, the innermost planet of our Solar System, is less than half the size of the Earth but is twice as close to the Sun as we are. Parts of Mercury’s Moon-like, rocky surface are heated by the Sun to temperatures nearing 800 degrees Fahrenheit (425 degrees Celsius). This is not a world like ours, certainly. However, in 1991, planetary scientists studied Mercury using a radar system consisting of NASA’s 70-meter (230-foot) dish antenna at Goldstone, California, equipped with a half-million-watt transmitter, and the VLA as the receiving system. The VLA was configured to map Mercury with detail down to 100 meters across. The beam of 8.5-GHz microwaves sent from Goldstone bounced off Mercury and was collected at the VLA to produce a radar image of the planet. The researchers used the Goldstone-VLA radar system to look at the side of Mercury that was not photographed by Mariner 10 in the mid-1970s. The resulting radar image, shown here, contained a stunning surprise. In this image, red indicates strong reflection of the radar signal and yellow, green, and blue, progressively weaker reflection. The bright red dot at the top of the image indicates strong radar reflection at Mercury’s north pole. In 1994, the team found a similar spot at Mercury’s south pole. “Normal” ice, such as that found on Earth, is like a sponge that absorbs radio waves, but ice at very low temperatures is a mirror for radio waves. The strong reflection seen on Mercury is too large to be caused by a momentary “glint” off a crater wall, and when studied in more detail, shares the characteristics of reflections from the water ice seen on Mars and the icy moons of Jupiter. Scientists now believe that ice collects on the floors of deep craters at Mercury’s poles, where it can remain permanently shaded from the Sun and reach temperatures as low as -235 degrees Fahrenheit (125 degrees Kelvin). Venus is our nearest neighbor in space and our closest relative in size — and, thanks to the thick layers of clouds hiding its surface, that was about all we knew about Venus for a long, long time. In fact, for decades, imaginary folks were convinced that the thick clouds created a sweltering rainforest of Venusian vegetation beneath them! Such fantastic theories were dashed when radio telescopes came on the scene in the 1950s. Venus’ clouds are no obstacle to radio waves — the long wavelengths of light pass through them. Radio astronomers announced that Venus had surface temperatures well above the boiling point of water! No jungle could survive in such a planet-sized oven, and descriptions of a harsh, desert planet soon arose. Poking at Venus with radar techniques, radio astronomers finally got a rough idea of the terrain beneath the thick blanket of gases surrounding it. In the early 1960s, radio telescopes beamed radio waves toward Venus. The radio reflections off the surface were uneven, and in particular, showed a huge mountain range looming beneath the clouds. Beaming radio waves over the course of hours revealed the biggest surprise: the mountain range swept across the view. Clearly, we were watching Venus turn – but it was turning the wrong way, opposite the spin of Earth! The revelation startled astronomers around the world. Before radio astronomy, we believed that all planets should spin in the same direction as they go around the Sun — counterclockwise. It’s nice, and it’s tidy, but now we know it’s also wrong. This radar study of Venus made us rethink our theories of how our Solar System formed. As radar techniques improved and spacecraft visited Venus with high-resolution radar onboard, the map of Venus grew more detailed. Under its clouds, Venus is a desert with rolling hills formed from lava squashed under the extreme pressure of the thick, hot air above it. Radar showed many craters and volcanic mountains taller than Mount Everest across our neighbor’s surface. Are Venus’ volcanoes still active? Perhaps! Robotic space probes on and around Venus measured spikes and dips in the deadly volcanic gas called sulfur dioxide. The simplest explanation is that a volcano burped it up. From 1994-2000, the U.S. Naval Observatory operated a 20-meter telescope in Green Bank, West Virginia as a station for its National Earth Orientation Service. Using super-distant, super-bright radio sources, such as quasars, as a wallpaper of stable reference points, this system of radio telescopes helped scientists measure the tiny shifts in the Earth’s crust caused by continental drift and clock the movements of the atmosphere and oceans. The system also helped calibrate global positioning services we now rely on as navigational aids in our mobile devices. Our own Very Long Baseline Array is still used to measure these shifts. Mars is a planet about half the size of Earth. Its surface, however, is dry and plastered with a geologic history of volcanoes and running water. To radio telescopes used as radar devices, the flat plains of ancient lava fields are extremely bright, as are the planet’s ice caps. Astronomers used the example of Mars’ ice caps to analyze the radar reflections seen on Mercury and propose that those, too, were caused by ice trapped in eternally-dark craters on that otherwise hot world. Thousands of asteroids orbit the Sun between the Mars and Jupiter, and dozens of Earth-crossing asteroids swing even closer. Radio telescopes used as radar instruments have observed the four largest asteroids: Ceres, Pallas, Vesta, and Hygiea, plus smaller asteroids that have flown past us over the years, such as Castalia, Mithra, Itokawa, Toutatis and 2012 DA14, which missed impact by a mere 17,200 miles! The radar results found that the bigger asteroids are covered with fine-grained dirt, the pulverized rock created by hundreds of millions of years of meteoroid impact. The surface of the Moon is similarly coated in this kind of “regolith.” Without atmospheres to slow and stop tiny impacts, the surfaces of these small worlds are repeatedly sand-blasted by all manner of space debris. Smaller asteroids turn out to show up as pairs of worlds orbiting each other or are in contact with each other, having not quite squashed into one big rock. By observing them over time, we can learn how these worlds tumble, which tells us about their rock and metal content as well as how their orbits around the Sun may change over time. Saturn’s atmosphere cools down toward the outer layers of this gas giant. The rings of ice and dust appear dark in front of the planet, because they absorb the radio waves from Saturn. Radio astronomers discovered intense belts of radiation surrounding Jupiter created by electrons trapped in its powerful magnetic field – 10x the Earth’s! NASA’s Voyager spacecraft “listened” to the radio emissions from Jupiter to capture bursts and whistles. 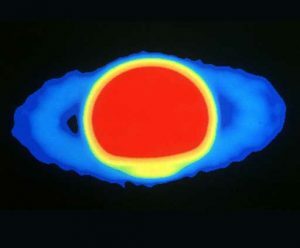 The VLA was among the many astronomical eyes tuned on Jupiter when pieces of a comet plunged into it in 1994. Jupiter’s radiation belts spiked in radio waves during the impacts and stayed bright for months after. Seeing deep within the gas giant of Jupiter, Saturn, Uranus, and Neptune is impossible with optical telescopes, but magnetic fields are usually a product of a warm, moving core, so they are a good guide to structures and activities within planets. If you’ve ever seen a meteor streak across the night sky, you’ve seen the column of blasted air molecules it has left behind. The glowing streak can last less than a second or remain visible for a short while. Meteor trails act like neon signs for radio telescopes that pick up these static bursts and across the sky. These trails advertise not only an atmosphere strike, but the speed, height, and angle of the debris entry. The mass of the debris is a basic calculation from those data. The Earth is constantly plowing into debris, collecting thousands of tons of space rock a year; so although you cannot see them, meteor streaks happen during the day, too. Radio telescopes can keep a 24-hour monitoring system tuned to meteor activity. In fact, a huge source of constant radio meteor data comes from citizen scientists who use their own equipment to monitor the skies. Radio telescopes can be called into service to receive the transmissions from spacecraft in orbit around the Earth or traveling across the Solar System. In the 1980s, we installed a set of special receivers on the VLA antennas to participate in NASA’s Voyager II mission, specifically to pick up the data transmissions from the spacecraft as it swung around the planet Neptune. In the 1990s, the 45-foot telescope in Green Bank was one of four NASA tracking stations dedicated to support of Very Long Baseline Interferometry (VLBI) satellites. The tracking stations transmitted a timing tone to the orbiting satellites. The satellites sampled their astronomical signals and transmitted the data on a downlink back to the stations. The tracking stations recorded the data on wideband magnetic tape that we shipped to NASA’s supercomputing facility for processing. 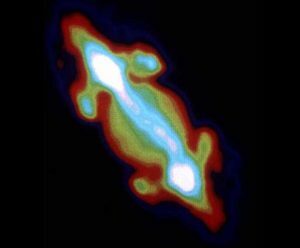 When the first space-based radio telescope, HALCA, launched from Japan in 1997, our VLA and VLBA paired with it to take images of galaxies at a level of detail never before achieved. In 2008, the GBT was called into action to closely monitor the dangerous 13,000 mph descent of NASA’s Phoenix Mars Lander onto Mars. Although the spacecraft could beam its data stream to spacecraft already in orbit around Mars, the GBT’s 2.3-acre dish easily grabbed that signal from tens of millions of miles away. Currently, the 43-meter telescope in Green Bank is a receiving station for the Russian 33-foot (10-meter) space-based radio telescope, RadioAstron. The GBT routinely pairs with this spacefaring radio telescope, that travels nearly as far from Earth as the Moon, to watch supermassive black holes in the hearts of distant galaxies.